Motor vehicle litigation: It can apply to any type of accident. Commercial vehicles, trucks, motorcycles, automobiles, and bicycles all operate on streets and highways, and all of them can be potentially involved in accidents that can be devastating to the victims who are injured during them. In some cases, motor vehicle litigation may extend further than a basic car accident, leaving the individuals involved in those accidents struggling to figure out what to do next. Does liability in your truck accident case go beyond a simple case of a truck driver causing an accident? Are you struggling with liability that involves a wide range of individuals and entities, including vehicle manufacturers, distributors, and retailers who have created an unsafe vehicle? Are there government entities who have caused poor street design, failed to maintain the area, or created unsafe conditions that contributed to your accident? Often, a detailed knowledge of all of these factors, including a strong knowledge of commercial vehicles and how they should be safely used on the road, is necessary in order to fully defend a truck accident case and ensure that the defendant receives the compensation they’re due. If you were injured in a truck accident, you’re not alone. In Orange County, truck accident injuries and fatalities are rising, from 336 and five, respectively, to 339 and 13 during a recent three year period. Contact us today at (714) 434-1424 to learn more about how we can help you pursue critical legal action following a truck accident in Orange County. Dealing with truck accident cases requires a strong understanding of the law, including state laws that impact the roadways; laws protecting drivers, passengers, and pedestrians; and the court system. At Aitken * Aitken * Cohn, we have extensive experience in the field of litigation that applies to individuals in truck accidents. Our associates are committed to providing the highest quality of representation to those injured by commercial vehicles. Consider how our past results have helped shape our success record and allowed our clients to pursue a better quality of life in spite of their injuries. Past case results do not guarantee a successful outcome in every case, but at Aitken * Aitken * Cohn we will bring this extensive experience to the table when dealing with your truck accident lawsuit. How much do you deserve in compensation for your accident? By working with us, you’ll know that you have a team of experienced attorneys on your side who will be willing to fight for you, increasing the odds that you’ll be able to receive the compensation to cover your expenses and support you as you move forward with your life. Not every case will receive a settlement or verdict, but working with us can substantially increase your odds of receiving the funds you deserve. Because trucks are often larger than other vehicles on the road, they have the potential to cause greater injury to the other drivers and passengers involved in accidents with them. There are several types of common truck accident injuries that you may find yourself dealing with in the aftermath of your accident. Whiplash and spinal cord trauma are common in any type of accident. Whiplash occurs when the body is jolted abruptly, requiring the spine to work rapidly in order to secure the head. Often, the muscles are strained as a result of this type of movement, leading to significant pain and suffering following the accident. In some cases, this rough movement may cause higher levels of spinal cord trauma, leading to ongoing pain or even paralysis. Broken bones are commonly caused when a part of the body strikes the pavement, the vehicle in which the injured individual was riding, or another vehicle. During a truck accident, broken arms and legs are common, as are broken extremities: hands, feet, and more. Truck accidents may cause a single broken bone, or they may cause several broken bones across the body, depending on the severity of the accident. Traumatic brain injury occurs when the injured party strikes their head during the accident. Traumatic brain injury can have life-altering symptoms that last for a long time, including everything from memory loss to struggle to concentrate, personality changes, and difficulty processing normal sensations. Burns can occur when one of the vehicles involved in an accident catches on fire. Vehicles often light up quickly, requiring injured individuals to move fast in order to get out of the way and prevent more severe injury. Unfortunately, once they have been involved in a serious accident, it can be difficult to prevent vehicles from catching on fire, especially if there is a gas leak or an electrical problem. Cuts and lacerations can be caused by contact with broken pieces of the vehicle or by contact with flying objects within the vehicle during the accident. These cuts and lacerations may be sustained during the accident itself or as victims are attempting to get away from the vehicle. Soft tissue damage may be caused by several factors during the truck accident. Victims may experience bruising, including severe bruising; sprains; strains; and even organ damage. Emotional trauma is every bit as challenging as the physical injuries suffered by individuals involved in truck accidents. Some individuals experience PTSD as a result of their truck accidents. Others may find themselves dealing with high levels of anxiety, moodiness, depression, or a struggle to involve themselves in their normal, everyday activities following a truck accident. Emotional trauma can limit the victim’s life just as much as any physical damage caused by the truck accident. Death. In many cases, truck accident injuries may be severe enough to lead to death. Because trucks are larger than other vehicles on the road, many vehicles may have little protection against them, which means that their passengers may experience severe injuries very quickly. When Injuries Occur in an Orange County Truck Accident, Who Is at Fault? Determining who is liable for your truck accident injuries can have a far-reaching impact on your life following your truck accident. You want to know that you’ve received the appropriate compensation for your injuries and that the right individual is paying for any damages caused by your accident. In truck accident cases, however, liability may be complicated. Working with an attorney is one of the most effective ways to help you determine exactly who is responsible for the injuries caused in your truck accident case as well as pursuing the compensation you deserve following the accident. Driving under the influence of drugs or alcohol, which is unfortunately all too common in the truck driving industry. The automobile manufacturer may be responsible for the accident when a defect in the truck is discovered to have played a critical role in the truck accident. In some cases, the manufacturer may have known that there was a defect in several vehicles of this make and model, but failed to take appropriate steps to notify drivers. In other cases, the manufacturer may not yet have been aware of the defect. An auto mechanic who worked on the truck. If the truck has recently been in for repairs, but the mechanic who worked on the truck failed to properly repair it, that lack of proper repairs can be one of the contributing factors of an accident. The mechanic can also be held liable if they could have reasonably been expected to see a potential problem with the vehicle while they were fixing it, but failed to make note of that problem while they were repairing the truck. The company that employs the truck driver. In some cases, the company that employs the truck driver may also be held partially liable for the damages caused by the accident. If the company has unsafe practices, including requiring the driver to drive for too long or even to falsify records so that it appears that they haven’t been on the road as long as they really have, they may be partially liable for the circumstances that led to the accident. 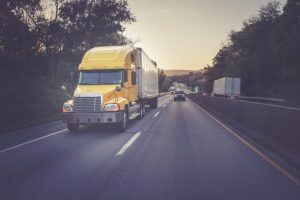 The company may also be held liable if the driver is known to have had problems with drinking and driving or has caused multiple accidents in the past, but is still employed by the trucking company. Bars and restaurants that over-served the truck driver. Did your trucking accident involve a driver who was driving under the influence? If so, it’s important to know where they got the alcohol. If they were over-served at a bar or restaurant by someone who knew that they were going to be driving, that entity can be held partially liable for the accident. The government. Take a look at the area where your accident occurred. Is it poorly maintained? Was there poor visibility that contributed to the circumstances of the accident? If so, the government agency responsible for maintaining that area or for the design that led to poor visibility may be partially liable for the events that led to the accident. Obtaining a settlement from the government can be difficult, but it’s not impossible with a good legal team on your side. In the case of truck accidents, there can be many different factors that contribute to liability. By working with an attorney, you can significantly increase the odds that you will correctly identify all the factors that were at work in your truck accident case so that you can increase the amount of your settlement and ensure that the people responsible for your accident bear the appropriate liability. Recovering Damages: What Can You Expect? Compensation for pain and suffering. You’ve suffered a great deal of physical and mental anguish as a result of your truck accident, and compensation can help you move forward with your life. Compensation for pain and suffering is often assigned based on a standard scale used by the insurance company. Payment for your medical expenses. Typically, the individual who is liable for your accident won’t pay for your medical expenses directly. Rather, they will issue payment to you that can then be used to pay for your hospitalization, your ambulance ride, your ongoing medical care, and your physical therapy. Payment for medical expenses can also be intended to help cover the cost of needed modifications to your home or vehicle to make them accessible after your accident. Lost wage recovery. If you were seriously injured in your truck accident, you may have had to miss work as you were recovering from your injuries. Lost time at work means lost income, which you can ill afford with bills piling up after the accident. In many cases, lost wages will be included as part of the damages you can recover from your accident. Lost income potential. Severe injuries can mean serious losses, including the inability to return to your former employment position. In this case, you may be able to recover not only lost wages, but also the lost income you could potentially have had, were you not injured. Funeral and burial expenses. When a truck accident ends in death, the surviving family members may be able to recover reasonable funeral and burial expenses used to help lay their loved one to rest. Trucking Companies, Insurance Companies, Mechanics: How Do They Try to Avoid Paying After an Orange County Truck Accident? Shift liability in your truck accident case. If it can be proved that you were at least 50 percent responsible for the accident, for example, the truck driver’s insurance company may not be responsible for paying for your injuries. The company may attempt to prove that the driver was not intoxicated in spite of clear indications that they were, or they may attempt to shift liability to the manufacturer due to a faulty part. Offering a settlement lower than you deserve. Many insurance companies will provide a fast settlement offer that simply doesn’t reflect the true amount of the sustained and expected injuries.. Hiring a lawyer sounds like an expensive proposition. If you’re struggling to get compensation for a truck accident, however, working with a qualified attorney can help increase the amount of your settlement and save you time and energy in dealing with the insurance company. When you contact Aitken * Aitken * Cohn, you’ll start with a free consultation that will help us better understand your accident and your needs and we operate on contingent fee basis instead of requiring payment up front, so our attorneys do not get paid unless we win. If you were in an Orange County truck accident, don’t wait to get legal help. Contact us today through our confidential contact form or by phone at (714) 434-1424 to learn how we can help you.